IC Insights is in the process of completing its forecast and analysis of the IC industry and will present its new findings in The McClean Report 2019, which will be published later this month. 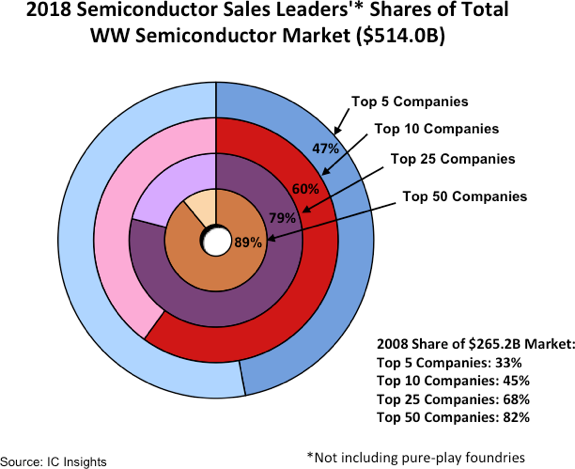 Among the semiconductor industry data included in the new 400+ page report is an analysis of the top-50 semiconductor suppliers. Rankings of the top 50 semiconductor suppliers, as well as the top 50 fabless IC suppliers, are included in the 2019 edition of The McClean Report—A Complete Analysis and Forecast of the Integrated Circuit Industry, which will be released in January 2019. A subscription to The McClean Report includes freemonthly updates from March through November (including a 200+ page Mid-Year Update), and free access to subscriber-only webinars throughout the year. An individual user license to the 2019 edition of The McClean Report is priced at $4,990 and includes an Internet access password. A multi-user worldwide corporate license is available for $7,990.